There are few artists that can sound this good live and George Michael is one of them… He actually sounds better live than he does in a studio and this song just proves my point and the next one after that. The family of singer Amy Winehouse say they have been left “bereft” by her death at the age of 27. Celebrities and fans have lined up to pay tribute to the singer after she was found dead at her home in Camden, north London on Saturday. Winehouse battled drink and drug problems throughout her career and news of her death was quickly followed by suggestions that it could be related to one or the other. But Superintendent Raj Kohli has warned it is “inappropriate” to speculate at this stage on the cause of death, which is being treated as “unexplained”. A post-mortem is likely to take place on Monday. One of Winehouse’s security team had found her and called an ambulance. The performer had said “I love you” at the end of a day out together, and her mother said she would always treasure those words. Celebrities including Russell Brand, Rolling Stone Ronnie Wood and producer Mark Ronson have all paid tribute to the multi-award winning performer, with Brand, a former addict, calling her “a genius” and saying addiction should be treated like a potentially fatal illness. Amy Winehouse, 27, was discovered at her apartment in north London by emergency services at around 3.54pm this afternoon, according to sources. A police statement said: “Police were called by London Ambulance Service to an address in Camden Square NW1 shortly before 16.05hrs today, Saturday 23 July, following reports of a woman found deceased. “On arrival officers found the body of a 27-year-old female who was pronounced dead at the scene. Amy had recently cancelled all tour dates and engagements after a series of erratic public appearances. But she appeared with her goddaughter Dionne Bromfield earlier this week at the iTunes festival where she urged the crowd to buy the young singer’s album. Amy had battled drink and drugs problems throughout her career. She has had a troubled life which has included various stints in rehab for drug and alcohol addiction. She said: ‘I’ve known for a long time that my daughter has problems. But seeing it on screen rammed it home. I realise my daughter could be dead within the year. We’re watching her kill herself, slowly. ‘I’ve already come to terms with her dead. I’ve steeled myself to ask her what ground she wants to be buried in, which cemetery. Because the drugs will get her if she stays on this road. 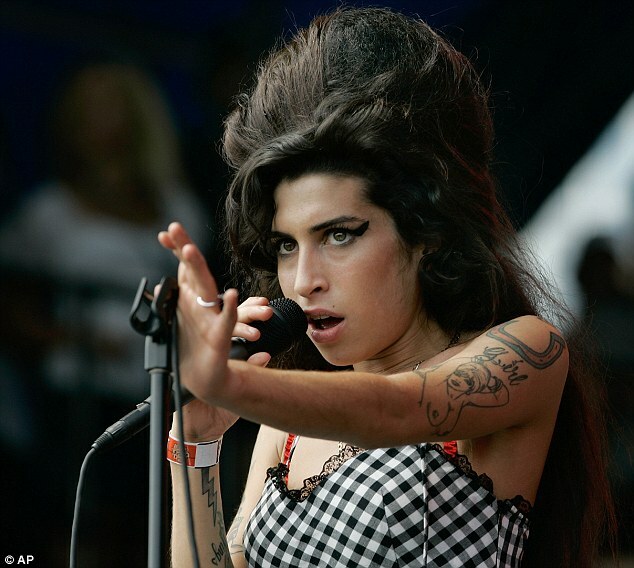 Amy Whinehouse is now on the list of famous people who have died at the age of 27, know as the 27 club. Other famous people who died at 27: Brian Jones, Jimi Hendrix, Janis Joplin, Jim Morrison, Kurt Kobain.